Nestled at the base of Mount Reit at the foot of the Braulio Valley, Bagni Vecchi is only 3 kms away from Bormio on the road to the Stelvio Pass. The Bagni Vecchi resort is the oldest thermal complex in the area, known as far back as the middle ages when it was referred to as the "Hospitium Balneorum". The nearby church of St. Martin dates from roughly the same period. From 1826, the castle was turned into an hotel but kept its original structure. This centre was recently refurbished and now offers 26 different thermal services. 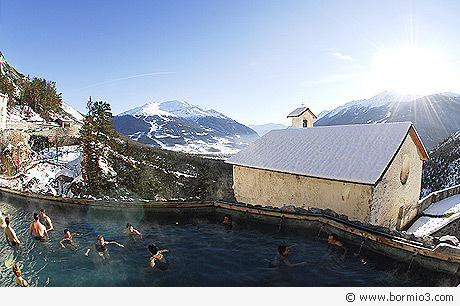 Particularly striking is the natural steam cave and the outside pool from where you can enjoy the spectacular view overlooking the Valley of Bormio. The Spa and the accompanying hotel offer a wide variety of beauty and health treatments in a unique historical environment.